Central Coast Cabernet Franc: not just a blending grape. Cabernet Franc, known and used primarily as a blending grape (it’s one of the main varietals in Bordeaux blends), also makes a great single varietal wine. Why? It’s generally a lighter wine with more acidity, making it food-friendly. It has many of the appealing characteristics of bigger reds (good body and deep fruit flavor) but doesn’t overwhelm with boldness. And it’s generally budget-friendly, as well. While 100% Cabernet Franc can be a bit hard to find, it’s well worth seeking out wineries that offer it. Lucky for all of us, the Central Coast (especially Paso Robles) is home to a several wineries that produce it. We’re excited to share what we found on a recent excursion – from barrel tastings to single varietals to high-percentage blends – plus tips on a few wineries that should be releasing a Cabernet Franc in 2019. The goodness awaits. Great Flavors doing some wine tasting at Adelaida Cellars. Cabernet Franc, which is thought to originate in the Basque country of the western Pyrenees, is the parent grape of Cabernet Sauvignon, Merlot, and Carménère. 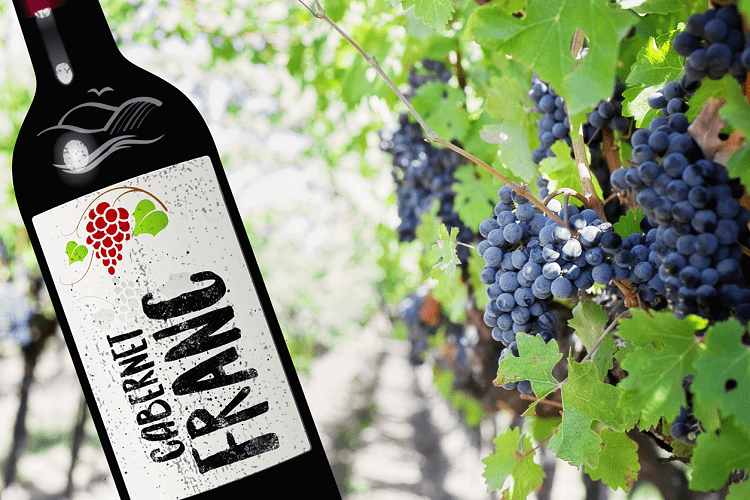 Grown most widely in France’s Loire Valley and Bordeaux region, Cabernet Franc is a contributor to Bordeaux blends, which also include Malbec and Cabernet Sauvignon in percentages that vary depending whether it’s Right Bank-focused (Merlot) or Left Bank-focused (Cabernet Sauvignon). The second largest producer is Italy, and third is the USA, including Napa and the Central Coast of California. As a blending grape, Cabernet Franc adds perfume, floral, tobacco and bright red and blue fruit. On its own, we can find floral, earth, leaves, and green pepper aromas with plum and black fruits. In California, its earthiness can be toned down by flavors of ripe strawberry, blackberry, and black cherry. Cooler microclimates along the Central Coast can produce Cabernet Franc with lighter color and body, and higher acidity. Primary flavors include red bell pepper, chili pepper, raspberry, wet gravel and dried herbs. Warmer areas tend to produce Cabernet Franc wines that are riper and more fruity, with flavors ranging from raspberry and dried strawberry to tobacco leaf, cedar, vanilla, and dried leaves. Barrel tasting the 2017 Cabernet Franc with Steve Gleason, Four Lanterns Winery. Because Cabernet Franc is such an exceptional blending grape, many wineries have selections with varying percentages of the grape. However, some wineries are showcasing Cabernet Franc as a single varietal, and it’s worth seeking out to taste it. A few wineries produce single varietals, but several were out of stock or their remaining Cabernet Franc was reserved for wine club members. We’ve noted them below and will visit in 2019. Now on to the tastings! 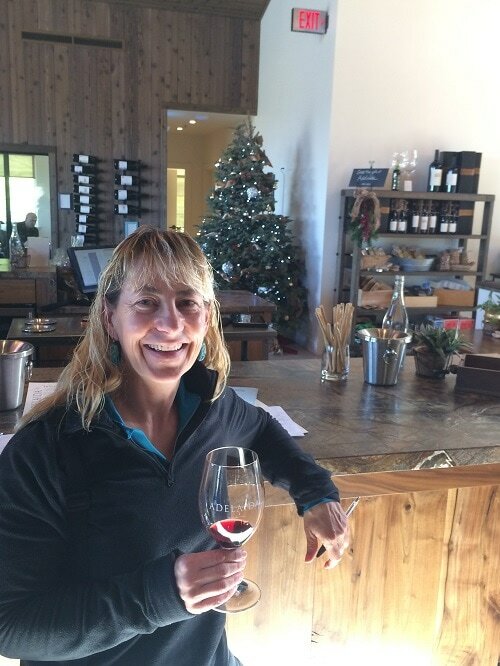 Tasting the 2016 Cabernet Franc at Dark Star Cellars with Adrienn Crowe. Dark Star Cellars. At Dark Star Cellars, along the Paso Robles 46 West wine trail, we tried their 2016 Cabernet Franc (with a slight addition of Malbec). Medium purple, it has a great balance of earthy and fruity. 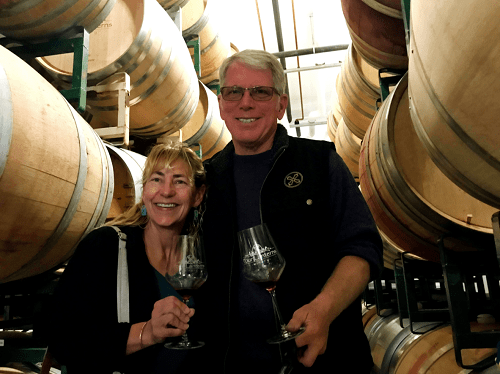 Winemaker Mike Emling invited us to try a barrel sample of the 2018 Cabernet Franc. It had only been in barrel a week or two, but its taste hints at its quality later on. Four Lanterns Winery. Another winery on the 46 West Highway, Four Lanterns has 2017 Cabernet Franc that will be bottled in the spring. We sampled two barrels with winemaker Steve Gleason. Both in new oak, the sample from the barrel with lighter toast was rounder, aromatic, with notes of fresh plum and violet. The other had Christmas spice and a long finish. We look forward to trying these once bottled. 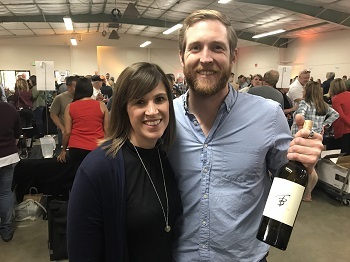 Taylor Berkley from T. Berkley wines with his 2016 Cabernet Franc at the 2018 Garagiste Festival. T. Berkley Wines. 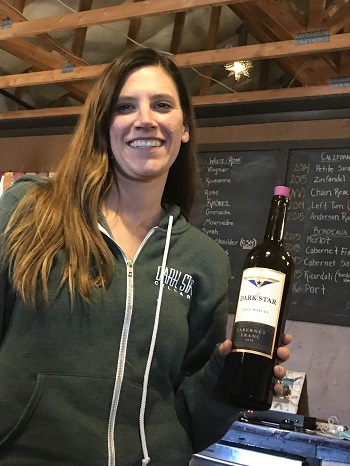 We met winemaker Taylor Berkley Bodstun at the 8th annual Garagiste Festival in November. We thoroughly enjoyed his 2016 Leaning Oak Vineyard Cabernet Franc from Napa’s Los Carneros AVA. Next time we’re in the Napa area, we’ll stop in for another tasting. Villa San-Juliette Vineyard & Winery. At Villa San-Juliette Vineyard, located in the northern Paso Robles Estrella District, we tasted their 2015 Cabernet Franc. Medium to deep ruby in color, the nose had floral and lavender and raspberry, with tastes of blackberry, raspberry, and bit of earth and black pepper. It had good balance of fruit, acidity, and tannin. 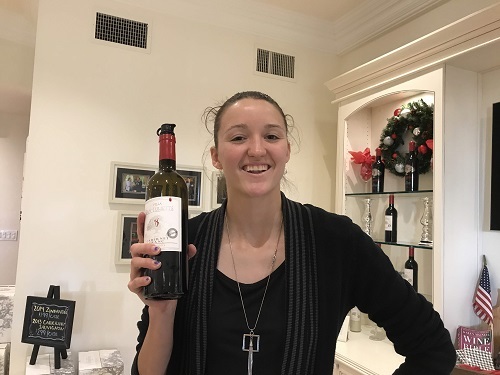 Danielle showing off the Villa San-Juliette Vineyard’s 2015 Cabernet Franc during a recent tasting. These wineries typically have a single varietal Cabernet Franc on their list. We look forward to trying them in the future. Adelaida Cellars, Paso Robles. Cabernet Franc is typically available at Adelaida, but when we visited it was not on the tasting menu. They did have a 2016 on their website for purchase. Brecon Estate Wine, Paso Robles. We’ve heard Brecon has made a good Cabernet Franc in the past, so we’ll head back when it’s available again. Chateau Margene, Creston and Morro Bay. This winery offers a 2013 Cabernet Franc on their website. Dracaena Wines. Fellow wine enthusiasts recommended the Cabernet Franc from Dracaena, which does not have a tasting room but usually has its wines at Wine Boss in downtown Paso Robles. It was out of stock when we went, but we’ll try back again. We met a number of small-production wineries at the Garagiste Festival that produce Cabernet Franc. We’re looking forward to trying these.